Our last update has been a major success! How major, you ask? We will let the numbers do the talking. On March 13, we launched Galahad and revealed a new world map, improved PvE and an abundance of other new content. In the four weeks since the update you, our 212,815 Founders from all over the world, have already played a total of 2,804,864 hours. That is over 320 years’ worth of playing Albion Online! And that is only a few of the numbers we gathered from the update so far. 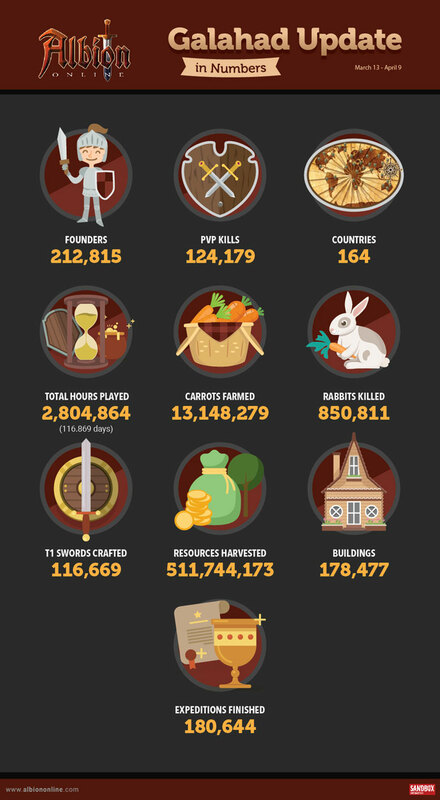 Here are some of our favorite Galahad statistics wrapped in a neat infographic. Enjoy!